LAS VEGAS – Oct. 9, 2017 – Barrett-Jackson and Shelby American have teamed up to build a 50th Anniversary Shelby Super Snake in the DIY Pavilion presented by Tub O’ Towels during the 10th Annual Las Vegas Auction, Oct. 19-21, 2017, at the Mandalay Bay Resort and Casino. 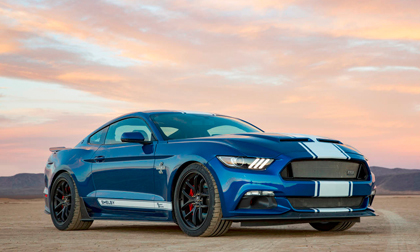 This will be the first Super Snake built by Shelby American outside its Las Vegas facility, providing auction guests with the unique opportunity to see the muscle car manufactured by an assembly team including factory technicians and Craig Jackson. The 2017Shelby Super Snake will be built in the DIY Pavilion presented by Tub O’ Towels, adjacent to the Future Events exhibit. The build process will follow the same production schedule that would be completed inside the Shelby American factory. It will start with the base Ford Mustang GT, which will be upgraded to a 750-horsepower muscle car with the integration of an upgraded track handling pack, supercharger and exhaust from Ford Performance, as well as 20-inch forged aluminum wheels and a Wilwood brake system. Shelby badges will be included throughout the vehicle and it will receive a special designation in the Official Shelby Registry as being built by Shelby American outside the Las Vegas factory.